Wind turbines and solar panels make Langeland Municipality more than self-sufficient, allowing renewable electricity exports. In the South Funen archipelago, Langeland Municipality is known for its beautiful greenery. But not everyone knows that Langeland’s energy is also green. The island’s many wind turbines and solar cells produce so much renewable energy that the supply level is between 140% and 162% of Langeland’s demand. While the municipality already exports its surplus production, plans are underway to expand energy production even further. As part of the 2013-2025 municipal plan, a rehabilitation of older, poorly placed wind turbines is planned. 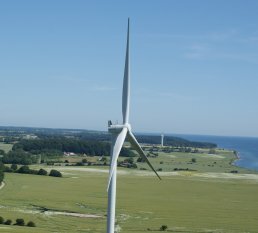 Langeland aims to combine this update with an expansion of both wind and solar energy in southern Langeland. With this expansion, it will be possible to increase wind energy production by approximately 13,600 MWh. In Langeland, many private households have invested in renewable technologies such as solar panels, geothermal heating and/or mini wind turbines. Furthermore, the Langeland Electricity utility has a fund dedicated to energy procurement and distribution projects on the island. The fund also supports Langeland’s local cultural scene, enabling the construction of 12 art towers located around the island. In Langeland, total renewable electricity production in 2017 was 120,616 MWh, equivalent to 162% of the municipality's total electricity demand. In 2017, Langeland’s wind turbines produced 118,410 MWh, and their solar cells 2,206 MWh, making the island’s 74,561 MWh consumption self-sufficient. In Langeland Municipality, more than 15% of private employees work in the wind turbine industry. The Langeland Electricity Fund supports activities that will strengthen the municipality’s community, its local artists and the creative environment. Langeland municipality is comprised of the islands of Langeland, Strynø, and Siø.